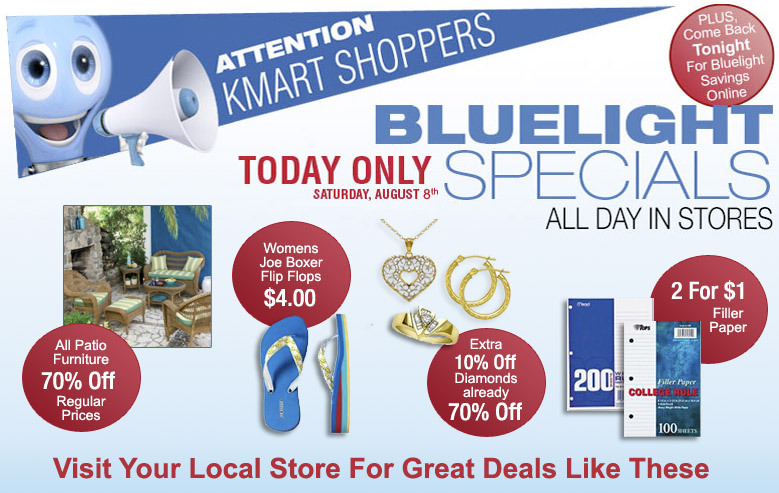 Just About Anything: The Bluelight Specials is Back! "This post was sponsored by Kmart. All the opinions are mine." I always love a great sale, and a timely one at that. And I think Kmart understands my sentiment when they brought the Kmart Bluelight specials back. YES, It is back! And who wouldn't love a great ONE-DAY sale in-store or online? With over 40 great deals to watch out for, you wouldn't want to miss this one! It is still officially summer and the Womens Joe Boxer Flip Flops for only $4.00 a pair will just be perfect to complete any woman's summer wardrobe. And for those heading back to school in a few weeks, it would be smart to arm yourself with loads of Filler Paper. You should take notes this time, after all, it is only $1 for 2 packs. And even if I am no longer in school, I would gladly stock up on these, knowing that I love to doodle and write what-nots to my friends. So what are you waiting for? Head on over to your local Kmart store NOW. It only runs today, AUGUST 8th. And if you want to be updated on great deals like this, be sure to follow Kmart on Twitter and never miss out on great deals ever again!